First impressions count. Guest check-in is fast and easy so you can spend more time interacting with your guests. Adding extras such as mini bar charges, breakfast packages and valet parking is simple. 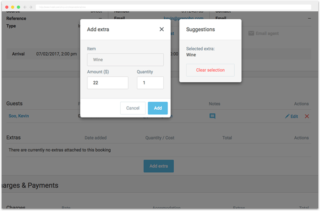 Preno will even suggest your popular extras so you can add it to the booking quickly. 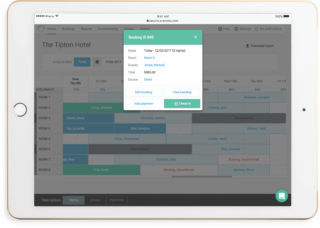 Offering your guests the ‘dine first, pay later’ experience at your property doesn’t need to come with additional admin. 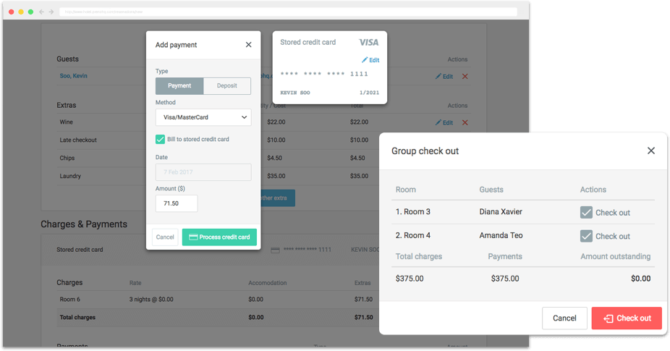 Send guest charges from your restaurant or bar’s POS to Preno automatically using our integration with Kounta POS. Your guests can then pay off all charges at once, when they checkout. Kounta is an online point of sale platform for the bars, restaurant or retail store at your property. Preno integrates with Kounta to enable your guests to ‘bill to room’. Find out more about Kounta POS. Your guest’s credit card can be added to their booking securely in Preno. You can then charge their credit card at the end of their stay directly from Preno, making the checkout process quick and delightful. Preno integrates with Stripe and Braintree for integrated payments. Preno is flexible, and supports most payment methods such as cash, credit cards and invoices. Tracking the different payment types makes it easier to reconcile your accounts.